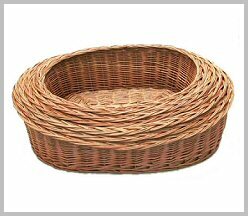 Our wicker pet baskets and pet beds are made from willow, which gives them a timeless, natural appeal, and provides a very special place for your pet to call his or her own. 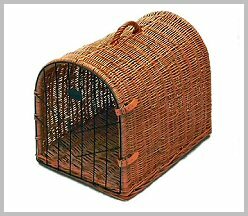 Being natural, our pet baskets and carriers are far more comfortable for your pet than unnatural plastic or metal beds and baskets. They are also easy to clean - just hose down with water (outside, or in the shower) - this not only cleans the willow, but also tightens it, making sure the weave remains in the best condition. When we set out to source pet baskets, we were surprised to find that they are not only difficult to find, but that the quality was often lacking. We were therefore very excited to find these baskets which really are very attractive and well woven - in fact our own level of satisfaction with these products is more than matched by the steady flow of positive feedback we receive from members of the public who have purchased these from us. 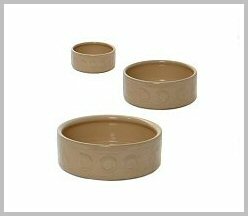 Most baskets come in various sizes, so you can choose the one that is just right for your pet.